We sell Rio Amazon products like Rio Rosa Mosqueta anti-ageing day & night cream 50ml online in the UK and directly from our award-winning store in Scotland. Rio Amazon anti-ageing day & night cream with rosehip, shea butter, calendula and chamomile. Rio Rosa day and night cream. Rio Rosa Mosqueta Anti-Ageing Day & Night Cream combines the benefits of rosehip seed oil, coconut oil with nourishing shea butter and softening calendula. Red algae is known for its natural UVA filter which helps protect against premature ageing. Free from parabens, paraffin, synthetic substances or perfumes. Aqua (Water), Glycerin, Butyrospermum Parkii (Shea) Butter*, Rosa Rubiginosa (Rosa Mosqueta) Seed Oil*, Cetearyl Alcohol, Cocos Nucifera (Coconut) Oil*, Octyldodecanol, Glyceryl Stearate, Macadamia Ternifolia (Macadamia) Seed Oil*, Sodium Stearoyl Glutamate, Aloe Barbadensis (Aloe Vera) Leaf Juice*, Porphyra Umbilicalis (Red Alga) extract, Rosa Centifolia (Provence Rose ) Flower Extract*, Camellia Sinensis (White Tea) Leaf Extract*, Calendula Officinalis (Marigold) Flower Extract*, Helianthus Annuus (Sunflower) Seed Oil*, Caprylyl Glycol, P-Anisic Acid, Xanthan Gum, Lactic acid†, Tocopherol, Tocopheryl Acetate, Sodium Lactate†. We sell real Rio Amazon and other Facial Moisturisers directly from our shop in Scotland and online throughout the UK. View more products from Rio Amazon. Where can you buy real Rio Rosa Day&Night Cream safely online? If you are wondering where you can buy Rio Rosa Mosqueta anti-ageing day & night cream 50ml safely online in the UK, then shop with us. We are an actual health foods shop; with real people selling real foods and products. Our award-winning independent shop is located in Stirling, Scotland since 1976. You can buy our Facial Moisturisers in store or safely place an order with us online or over the phone. 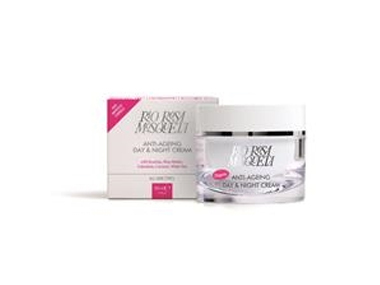 Rio Rosa Day&Night Cream - Rio Rosa Mosqueta anti-ageing day & night cream 50ml in Facial Moisturisers and Facial Care.